Considering he was never too far up on the card, MAZADA had a fair amount of success in 2005. He started as a part of the heel tag team with NOSAWA, but the team split when NOSAWA no longer wanted to cheat to win. Their feud ended with a "loser must leave All Japan" match, which was won by MAZADA. MAZADA even challenged for the All Japan World Jr. Heavyweight Championship against TAKA Michinoku, but he came up short. For much of the rest of 2005, MAZADA feuded with Space Lone Wolf, who wrestled mysteriously similar to the banished NOSAWA. Another slow year for MAZADA, although he was a constant fixture on the All Japan cards. MAZADA got a chance at Kondo's All Japan World Jr. Heavyweight Championship on April 20th, but Kondo would come out victorious. By the fall regularly tagged with the freelancer Minoru Suzuki, helping him stay in the midcard as he helped Suzuki pick up a few key wins. He also began teaming again with his old partner NOSAWA. MAZADA teamed with NOSAWA for the start of 2007, but when NOSAWA joined the Mexican Amigos he started teaming strictly with Minoru Suzuki. MAZADA feuded for most of the summer with the Mexican Amigos and even brought in other Japanese wrestlers (actually Mexican wrestlers) to start a Mexico vs. Japan feud (with the Mexican wrestlers really being Japanese and the Japanese wrestlers really being Mexican). MAZADA did not take part in the Jr. Heavyweight League or the Champion Carnival, and generally was only used to fill the mid-card of events. With the Mexican Amigos feud over, MAZADA began teaming with Nosawa again, along with their new friend TAKEMURA. Eventually they would join forces with Minoru Suzuki and Taiyo Kea, forming the faction of GURENTAI. With Suzuki and Kea the powerhouses of the group, MAZADA mostly wrestled in the mid-card with NOSAWA against the Regular Army. In the Jr. Tag League, MAZADA teamed with Nosawa and together they would come in tied for 3rd place. He also wrestled in the Jr. Heavyweight League and did very well, getting victories over Kondo and El Samurai but failing to reach the finals. 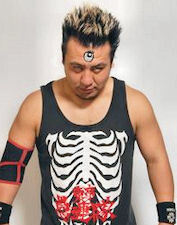 MAZADA stayed in GURENTAI for the whole year, often teaming his old friend NOSAWA in smaller matches. In the Jr. Heavyweight Tag League he tamed with NOSAWA and the duo came in 4th place, including a big win over Kaz Hayashi and Shuji Kondo in which MAZADA pinned the champion Hayashi. MAZADA also took part in the Jr. Heavyweight League, but he came in 4th place in his Block with only a win over Hiroshi Yamato. MAZADA did challenge for the All Japan Jr. Heavyweight Championship on July 5th against Hayashi, but Hayashi would win with the Power Plant. Since GURENTAI has five members, MAZADA was the odd man out in the Real World Tag League and did not participate.